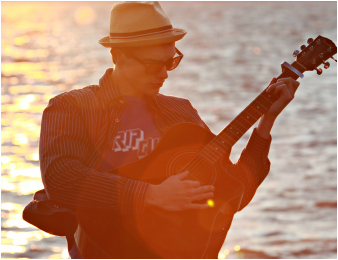 Graham Outten Bio - Outer Banks Live Music - Your source for live music on the Outer Banks! decided to come back home to figure out what to do next. After working a few odd jobs from bussing tables, construction, local writing stint, I got a job at a local real estate company of which I worked at for a little under a year. It was through working this job I was able to get a better understanding of how business down here on the OBX works and how I could make mine a success. My business began to take off and I found myself at a crossroads either stay in real estate and get my license or take a huge risk and quit and pursue music full time. Guess what I did? Through hard work, countless hours rehearsing, saving money for equipment, and branching out with other artists in the area, the love of my life, my partner in crime, and my baby, my set "Acoustic Nights with Graham Outten" was born. My musical journey has led me to many amazing venues on the east cost as well as many wonderful opportunities on the mainland. I look forward to see what life has in store for me in this business that I have the privilege in working. God is good and life is great on the Outer Banks of NC. Thanks to all the friends, family, and AMAZING local talent that I get to call my colleagues and friends for so much support! !